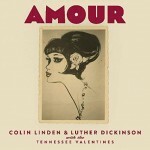 Of course, the excellent songlist goes a long way towards assuring a successful session but the atmosphere that roots music veteran guitarists Colin Linden and Luther Dickinson and their cohorts generate here turns each of these classic tear jerkers and torch songs into particularly intoxicating mood pieces. It’s a toss-up whether Rachael Davis or Ruby Amanfu is the more evocative vocalist on their respective features- Jimmy Reed’s “Honest I Do” or Kris Kristofferson’s “For The Good Times”. Pleasing as well is Sam Palladio’s two-part with Ms. Davis on “Crazy Arms” and country royalty Billy Swan working his own “Lover Please”.